Paws for a Cause is an event for pets and their owners to raise funds and awareness for the American Cancer Society's fight against cancer. Don't have a pet? No problem! 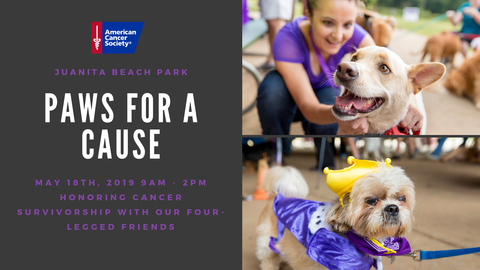 We will have activities for both pet owners and those without a pet that would like to support the American Cancer Society. There will be a 5K fun walk around Juanita Beach Park, dog agility courses, costume contest, vendors, face painting, and more! By supporting Paws for a Cause, you help the American Cancer Society save lives, and that helps us move closer to our ultimate goal of a world with less cancer and more birthdays. This is a day to celebrate cancer survivors, celebrate our canine caregivers, and remember those who we've lost from this disease. So bring your best four-legged friend and join us for a fun-filled day starting with a walk, and then continuing with demonstrations, contests, and games. Vist us on Facebook to keep up to date on the latest event updates!